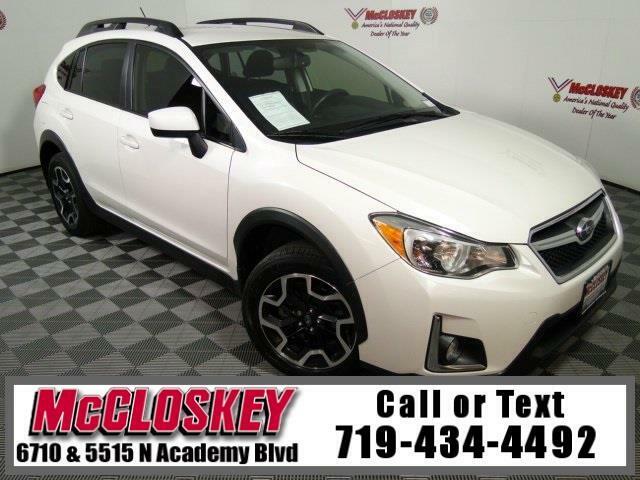 Trek all of Colorado in this luxurious 2016 Subaru Crosstrek 2.0i Premium All Wheel Drive with Heated Seats, Backup Camera, Premium Sound System, and Premium Wheels! The 2.0i Premium adds heated mirrors with body-color housings, heated front seats, an adjustable center armrest, a leather-wrapped steering wheel and shift knob, interior contrast stitching (on the steering wheel, automatic shift knob and cloth upholstery), a cargo cover, a removable cargo tray and a six-speaker audio system. Dynamically, the Crosstrek feels confident and composed on slippery roads, where its standard all-wheel drive and stability control systems make its reactions very predictable.